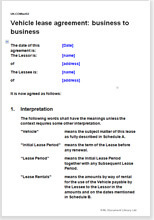 Lease any vehicle: business to business. a fleet owner who leases cars, vans to individuals for a long trip. Because this lease agreement is exempt from the consumer regulations, we have taken the advantage and include all the commercial provisions you may need to have in your lease agreement. As this agreement is exempt from the European Union (Consumer Information, Cancellation and Other Rights) Regulations 2013, the terms are based on common law that deals with the basics of contracts: offer, acceptance, price and payment, provision of service, liabilities and risk. This document can not be used as a consumer hire agreement under the Consumer Credit Act, 1995.